50 Multis and 45 NEW samples are in this super diverse library for Omnisphere 2.5! Created by 15 world-class programmers (some of them sell patch libraries on their own websites), this is a special library because the programmers made sounds that match their personal passions in sound design and patch making. Listen to the awesome audio demos, watch the patch walkthru video (and other support videos) and you will be impressed with what YOU can do by adding this amazing library to your arsenal! Many genres are represented in this library with a very strong nod towards huge analog waves combined with digital waves and effects for some truly signature sounds to work with. Every patch has the Modulation wheel assigned to do something interesting to the sound. Sometimes it’s the expected pitch LFO but most of the time, things will happen you didn’t expect but will bring a smile to your face! First unzip the file you have downloaded after purchase. 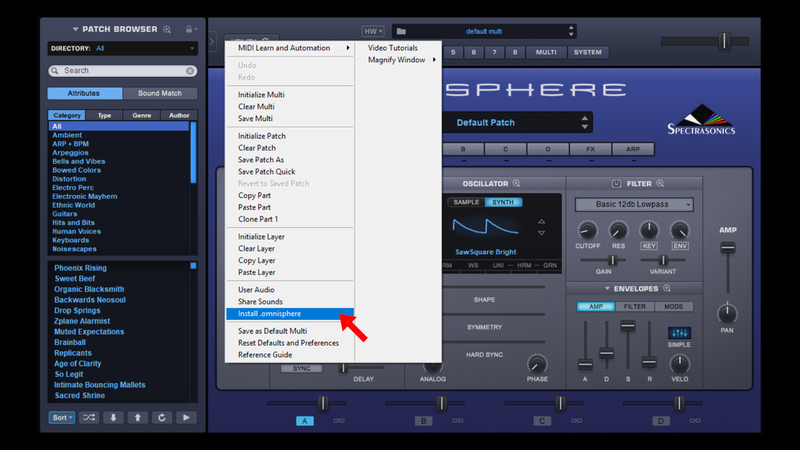 Open Omnisphere and click on the UTILITY button and elect Install omnisphere as shown in image 1 below​. 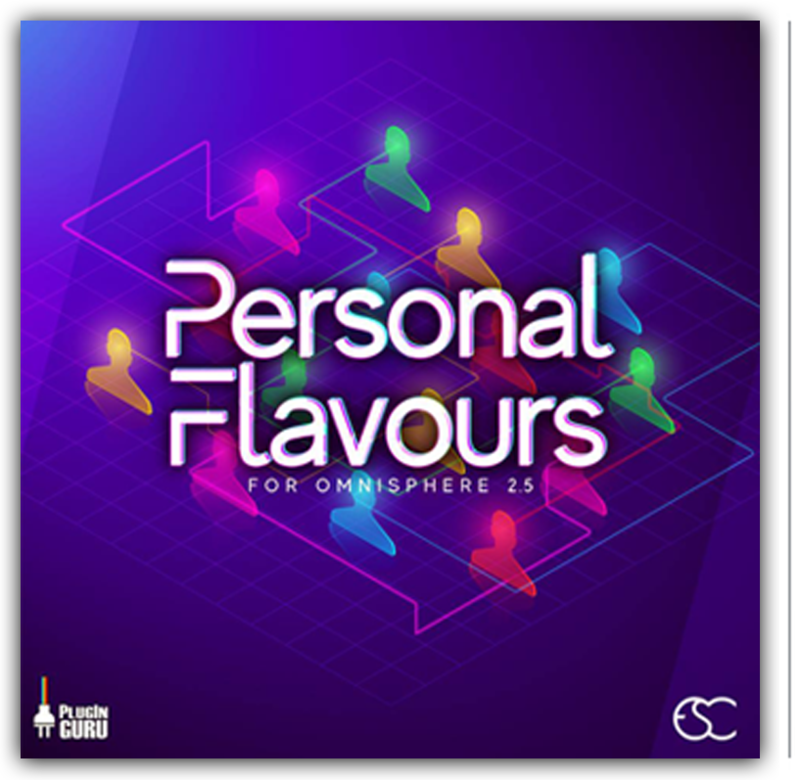 Locate the ESC Personal Flavours folder you have jcreated and open ESC Personal Flavours.omnisphere to install the single patches, the multi patches and the samples. In case the ESC Personal FlavoursI bank isn't active in the left window after installation, you can access the ESC Personal FlavoursI single patches by clicking on the DIRECTORY tab on the top left of Omnisphere’s main window, select the User entry and then selectt ESC Personal Flavours as shown in image 2 below..
To access the ESC Personal Flavours Multis, open Omnisphere's MULTI BROWSER by clicking on the multis name box on top of Omnisphere’s main window. In the MULTI BTOWSER, click on the DIRECTORY tab on the top left, select the User Directories entry and then select ESC Personal Flavours as shown in image 3 below. 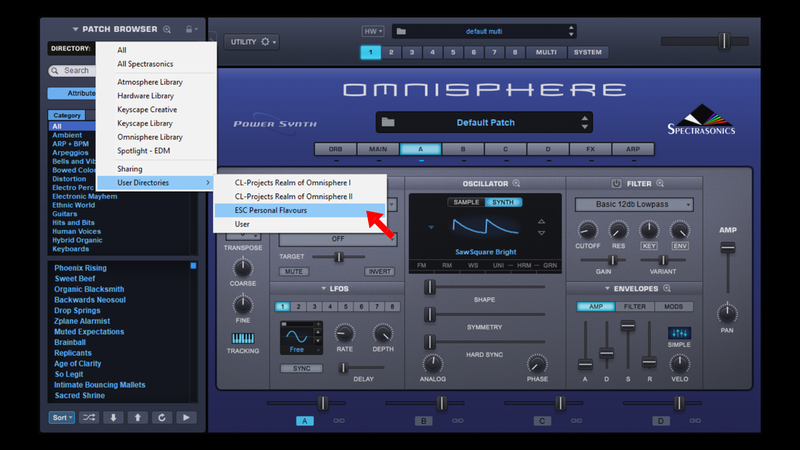 If you still can't see the ESC Personal Flavours single patches and/or multis after installing, click on the Refresh circular arrow button on the bottom left of Omnisphere’s main window as shown in image 4 below. . 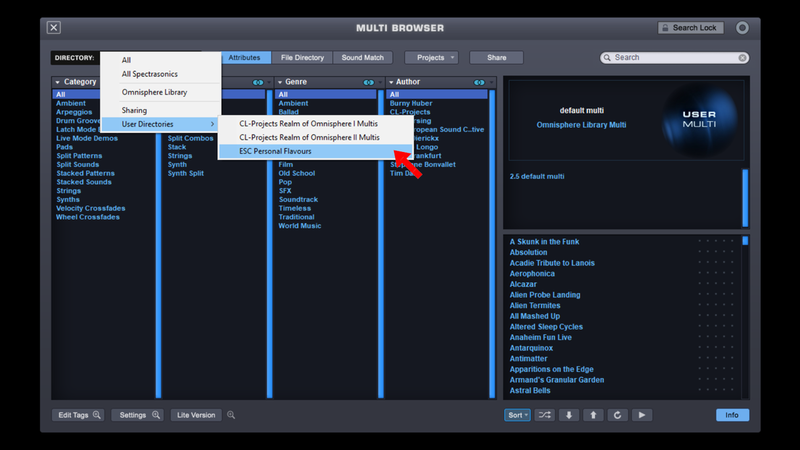 If the ESC Personal Flavours and the ESC Personal Flavours in the Multis section are not visible after refreshing the database, either close Omnisphere and open a new instance and if even that doesn’t help, restart your DAW. 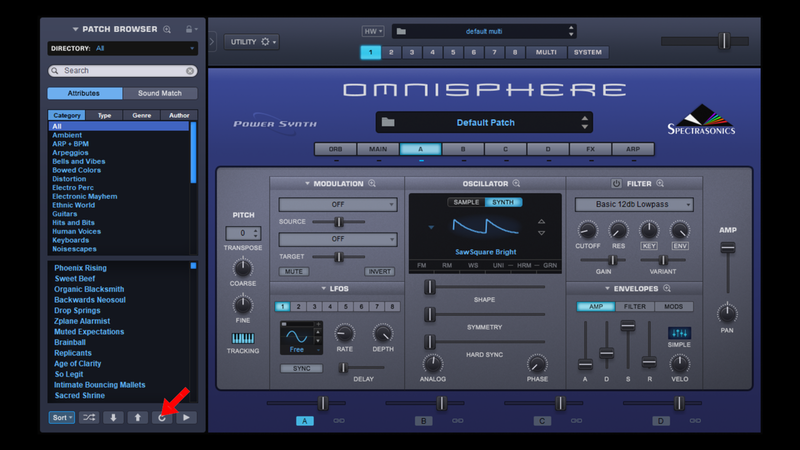 I recommend installing the patches via the standalone version of Omnisphere 2.5 since this seems to give less problems. "ESC Personal Flavours is the 2nd Omnisphere 2 release and the first to use the updated 2.5 features in Omnisphere. ESC stands for 'European Sound Collective' and is made up of 15 amazing sound designers from all over the world. The first release was an incredible tribute library to John "Skippy" Lehmkukl of PluginGuru.com where these libraries are sold. I did a review of the ESC PluginGuru Tribute Library back in June of 2018 and absolutely loved the diversity of the patches. In fact, when Personal Flavours was released I was wondering if it could hold up to the originality of the debut. One thing I love to do when I get a new library is to demo each patch and record my experience. I ended up making a 2 hour and 55-minute video auditioning each patch in the Personal Flavours library. If you watch the video, I operate the modulation wheel so you can hear what effects were assigned to each of the patches. The video can be found below at the bottom of the page but please read on. It's been said," variety is the key to success" and I can't argue with a library that was created with 15 talented forward-thinking sound programmers. Honestly, it was so frustrating playing a snippet of each patch because all I wanted to do was stop and start writing a new song. These patches are full of inspiration. I imagine there's a lot of pressure to create something very memorable because your name is attached to this library. I mean, you don't want to be the guy that releases a patch that sits on the 1-star list. You want to give your best because you're among the best. ESC has taken an idea and created a reality. It's like buying one of those ‘best of the decade’ albums and getting nothing but hit songs. These patches are a collection of hits from some of the most talented people all over the world. There is a total of 16 categories plus the multi section in this library and is comprised of 45 new soundsources for Omnisphere. 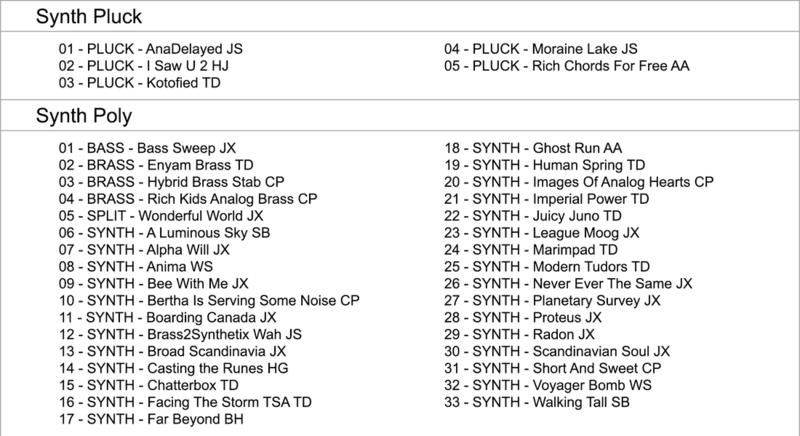 Some of the patches make use of the granular synth engine that can be CPU intensive. I noticed this mostly in the multi section where the patches that use granular were stacked. I did have a lot of resources running on my laptop, so I figure this contributed to my problem. Hopefully, Spectrasonics does something to address the granular CPU issue with the next update because it is an ongoing complaint among users. Nevertheless, I can't fault this library for the granular CPU intensity. Another great thing about Personal Flavours is the fact that you get to discover new talent from designers that you may never have heard of. So not only are you getting a passionate library of sound diversification, but they may be generating customers for life. After each patch in the general category section there are initials of the author who created the sound, or you can click on the author section. There is no specific niche of style or mood in this soundset. It's little bit of everything, making this library very versatile. My favorite part of the Personal Flavours is hard to say because there is so much there. However, let me try to name a few of my favorite categories. The first one I would pick is the Arp+Bpm because of the amount of content. 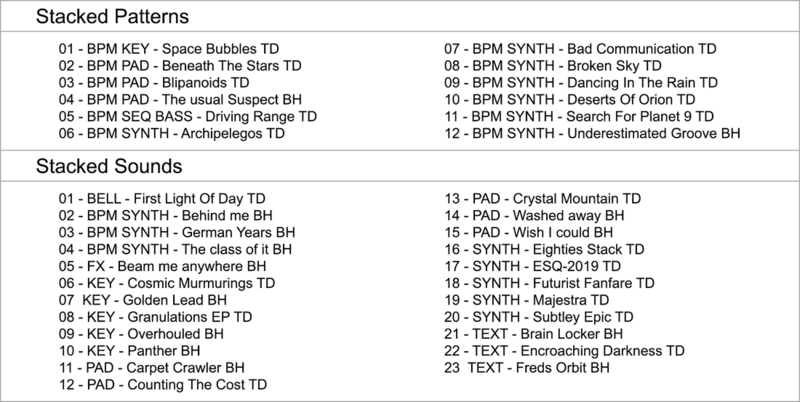 Everything from bpm sequences, bpm synths, bpm arpeggios, bpm textures, bpm pads, and more complete this category. My second favorite is the Pads + Strings, and the third is Synth Poly because of all the rich analog sounds. 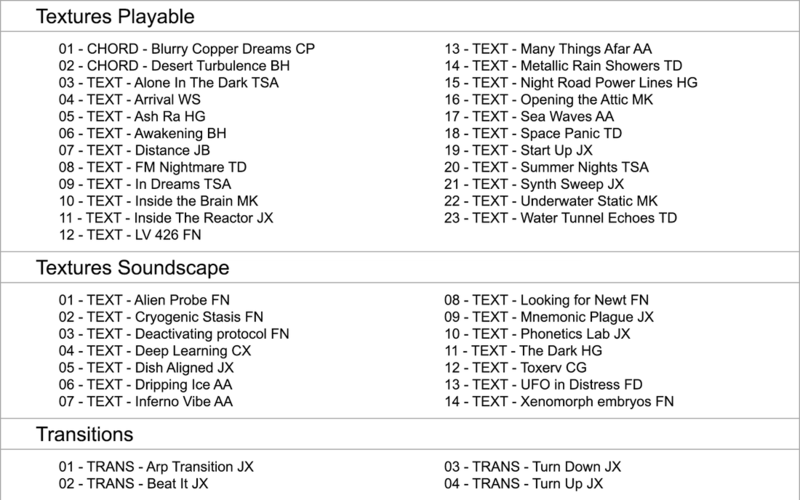 However, besides the extremely fun multis I cannot move on without mentioning the Textures soundscape category that was brewing with some incredible horror and sci-fi atmospheric environments. So, as you can see there is a lot of substance in this library. ESC Personal Flavours is what's on the menu my friends. Don't settle for processed junk, get a gourmet meal cooked up by some of the best sound design chefs in the business. This soundset for Omnisphere 2.5 is a library that will surely satisfy those taste buds and I'm serving it a ​5 out of 5 stars!!"